Presentation and Panel Discussion: 6 pm s.t. The events will be held in English. Helen Mayer Harrison and Newton Harrison – often referred to as »the Harrisons« – count as leading pioneers of the eco-art movement. In Germany, the Californian artist couple became better known not least for the EXPO2000 book »Grüne Landschaften« and their participation in the Federal Horticultural Show 2001 in Potsdam titled »Project Peninsula Europe«. 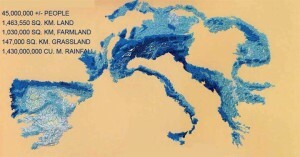 Both artists will be guests in Lueneburg on June 1 and 2 to present their »Peninsula Europe: The Force Majeure Works« series and their artistic practice in general. 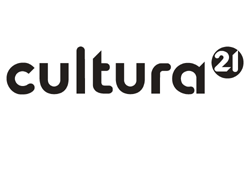 They have thus accepted an invitation extended by the project KIM at the Innovation-Incubator of the Leuphana Universitity of Lueneburg whose thematic focus this year is on »Art and Sustainability«. This event is organised in cooperation with the Kunstraum of the Leuphana University of Lueneburg. In the frame of their presentation, the Harrisons will explicate their artistic work and put it up for discussion in a subsequent panel, to which representatives of various disciplines of the Leuphana University of Lueneburg have been invited. The panel discussion will be followed by an open exchange with the audience. “Helen Mayer Harrison and Newton Harrison can look back on a forty-year artistic collaboration. Their works are included in the collection of the Museum of Modern Art in New York, in Centre Pompidou, Paris, and the Museum of Contemporary Art in Chicago. 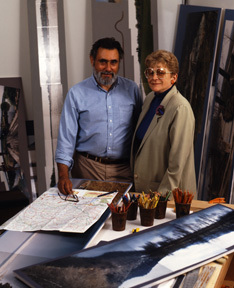 In contemporary art, the Harrisons represent a position that deals exclusively with ecological issues; their approach is characterized by the effort to establish broad communication, including the dialogue and collaboration with scholars from the fields of natural sciences, social sciences and cultural studies. What is remarkable is their decision to pursue an artistic strategy that, in face of the ecological crisis, does not impede reception through apocalyptic scenarios, but instead makes it productive for visions of the future that offer solutions to existing problems. Their ambitious proposals, for example, the reforestation of large parts of the »Peninsula Europe«, are understood as interjections in political debates, as a »conversational drift« that does not measure its success in regard to the degree to which the projects are implemented. In the multi-phase project titled »Peninsula Europe«, the Harrisons, against the backdrop of scenarios of climate warming, advocate the cultivation of a huge trans-European forest on Europe’s high grounds (300-350 meters). This reforestation would have the effect of a sponge that could counter the droughts forecasted by climate researchers. In their artistic work, Helen and Newton Harrison mainly fall back on cartographic representations, not least with the aim – as with the outlined project – of drawing attention to the arbitrary character of national borders. The event is based on a cooperation between Kunstraum of Leuphana University of Lueneburg and the project KIM, Innovation Incubator at the Leuphana University of Lueneburg, which is supported by the ERDF programme of the European Union and the federal state of Lower Saxony, as well as ICRA at Leuphana University of Lueneburg (Sacha Kagan).